Ron Lambert is currently living in aberdeen, Maryland, and is interested in Automotive. 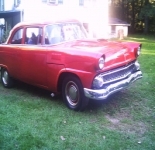 old car buff, doing car shows when possible, driving my custom 55 ford. This profile is owned by Ron Lambert. Send a message to this person to delete this profile.